The RSF-backed Prema driver finished where he started after persistent rain and standing water brought the curtain down on the postponed six-lap, two-stint affair. The race - which was initially delayed for two hours due to the treacherous conditions - eventually got underway behind the safety car only to be red-flagged after four laps. Then, when the race was restarted with a little over five minutes left on the clock it ran for a further one and a half laps only before it was red-flagged for the second and final time. With all laps run behind the safety car, the final finishing order mirrored the starting line-up with Carlin's poleman and points-leader Antonio Giovinazzi happy to take the win despite the circumstances. 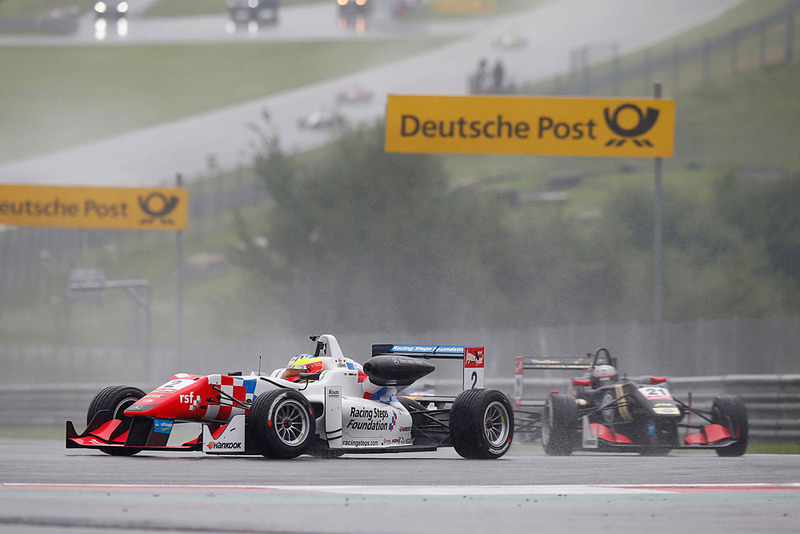 Chief title rival Felix Rosenqvist was classified second and Motopark's Sergio Sette Camara third. Due to the limited running only half points were awarded as a result of which Giovinazzi continues to head the table 12.5 points clear of Rosenqvist and 29 ahead of Van Amersfoort's Charles Leclerc in third. Dennis remains fourth on 248 with nine races to go - three apiece at Portimao, the Nurburgring and Hockenheim. "It was a bit crazy out there in those conditions," said Dennis. "I was barely able to see the car in front and was aquaplaning all over the place. So for me, stopping the race was absolutely the right decision."